Technically it only qualifies as 2 stars, but it gets extra for being The Tribe. Its not something I would recommend for a non-Tribe fan (though I recommend the show, watch it! ), but its alright. More exciting than the first one in terms of plot, though felt more rushed and fragmented at times. Obviously, this book series is only a recommended read to those are familiar with The Tribe and have watched all 5 seasons. Having said that, I found "A New Dawn" a much more compelling - and frankly, less boring - read than the first book. The story didn't get stuck and A.J.Penn managed to keep the characters mainly plausible and true to their nature. Loved the twists with Ebony, was surprised to read about several deaths in this book and did enjoy the storyline with Eloise.Also, Amber & Bray held the center of attention a lot in this book and can't say I had anything against that ;)Bonus points for the little twist with May's new love interest. FINALLY. Perhaps an octave less exciting than A New World, I still found this book to be exciting and enjoyable.For nerds such as myself, there was a coded message at the end of the book that readers could decipher using Jack and Ram's code used in the book. So much fun! Though I found the note to be somewhat cryptic, it lead me to believe (and hope!) that there will be another book, hopefully soon! I really liked the continuation of the story and finding out what happens to the characters I love but there are still some unanswered questions. I still would like to know what happened to some of the other Mall Rats that were taken by the Technos. I need more.After being reunited with amber and the other Mall Rats, Bray and his friends must take on the Collective. Some friends could be lost along the way but new friendships will also be forged. The story is interesting because it's the Tribe and I want to know what happened... other than that the book is dreadful. The writing is shockingly poor - I could have done better myself - and it clearly hasn't been proof read. So disappointing. Power and Chaos by Paula Boock was done very well so I had expected a high quality book. This is rambling fan fiction. Waste of money. I really enjoyed this second book in the hopefully continuing book series about the "The Tribe" TV series. This book, much like the first one "A New World", can only be recommended to fans of said TV series or those who are familiar with it. I was delighted to see all my favorite characters back in action and searching for answers in order to understand the past as well as trying to make a better future for them and the generations to come.Characters (NO SPOILERS): A. J. Penn's character portrayal is (mostly) spot on. Personally, I could imagine the original actors portraying their respective characters actually saying and acting out the conversations in the book which made the reading experience even more enjoyable for me.Plot (SPOILERS ARE MARKED AS SUCH):The plot is (at least it was for me) full of surprises and gives new insights into our beloved Tribe world (KIND OF A SPOILER MAYBE?) with old and new places to be (re)discovered (POSSIBLE SPOILER ENDS HERE) answering a couple of questions from the old book. New questions and loose ends are (of course) created as the story line unfolds paving the way for another book.I very much enjoyed this book. It, however, did not get me as hooked on the story as I feel it should or could have: 4/5 stars. Ok. So definitely a change of pace from the last book. I've always loved the retro 80s style of The Tribe, and this book totally delivered on that "World War III" aspect, which is what I suspect that code at the end is referring to, along with the cryogenic bodies and gold plated hard-drive. I knew there was a going to be a major character killing but I didn't expect three, especially with two of them hardly being developed in the series. It felt rushed. Also, mentioning Tai San in the beginning and then never seeing her again is really frustrating. I was expecting a cliff hanger like the last one, but it just seems like the closure of one stage of the story into another arc of some kind. I never liked the naming of the babies after tribe members. It's so cheesy. I mean they've all lost their parents right? Wouldn't it be more appropriate to name them after all the adults that have died? I really want to know what happened to the ecos.... and of course the missing mall rats. Despite editing and spelling errors, I would definitely recommend this book to all Tribe fans. 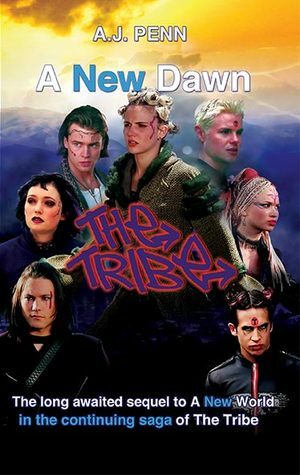 I loved the tribe when I was growing up and couldn't wait until Saturday to watch the latest episode on channel 5. I think I can safely say that a lot of tribe fans where gutted when the series was cancelled so when I found out that they were continuing on in book form I was so excited. I proceeded to purchase the first book 'A New World' in 2012 and loved the concept of old characters reappearing and also introducing new ones. 'A New Dawn' continues on with the storey and ties up a lot of loose ends that were left open at the end of the first book but it also introduces some new plots aswell. I hope that there is another book in the making and cant wait to carry on reading about the tribe and hope that more old characters reappear. Much weaker than it's prequel, and I only kept reading because I needed to know if Bray & Amber finally get together again - as "The Tribe" had been a huge part of my childhood.In that process, shedding some shocked tears during the last chapter, for things I didn't see coming. And the end provided a new storyline for a 3rd book some day. An awesome follow up to 'A New World' and a must read for all Tribe fans, I preferred this book to the first one. Literally couldn't put this down, I really enjoyed it and hope their is another instalment. Loved it!